Addressing media persons here today at Party Hqrs. Prof. Bhim Singh, Chief Patron of National Panthers Party lamented that the professional political leaders instead of working for peace and tranquility in troubled Kashmir, are adding fuel to the smouldering fire by their often repeated provocative statements just to keep their trading in politics up. He said that solution to end militancy and ensure equitable sharing of economic and political power amongst the three regions; Ladakh, Jammu & Kashmir is possible by Panthers Party mandate for reorganization of the state by creation of Jammu Pradesh, Kashmir State and grant autonomous status to Ladakh with all Fundamental Rights available in the Constitution of India.Prof. 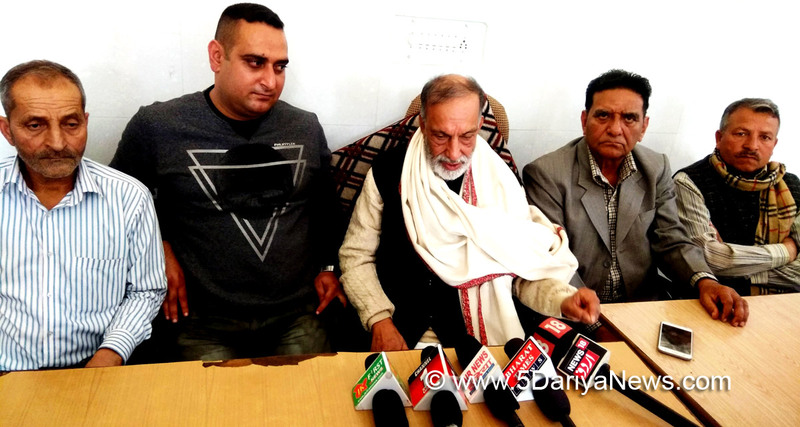 Bhim Singh said that it is essential to bring Union Flag & Constitution of India to Jammu & Kashmir state, provide basic Fundamental Rights to the citizens which have been denied to them through Article 370, also 35 A. This section was appended in the Constitution by a Presidential Order of 1954 only to facilitate J&K Govt. then under National Conference to silence political dissident voices in the state. Panthers urged upon the intellectuals and sane politicians of Delhi & State to deliberate upon the agenda of reorganization as pronounced by J&K Panthers Party years ago.It was announced that National Panthers Student Union shall hold One Day Students Annual Convocation on 1st December, 2018. NPSU shall also announce fresh agenda and elect new body.Senior State Vice President, P.K Ganju, Adv. Bansi Lal Sharma, Advisor, Ms. Anita Thakur, General Secretary, Thakur Virender Singh, State President NPSU, Shanker Singh Chib, State Secretary & Aditya Hans, Secretary Young Panthers were also present in the press conference.